Recently I blogged about the Seiko Astron - my dream watch. It was my dream watch not because of the brand or where it was made but rather because it fulfilled a few specific features which I wanted in a watch. Well, quite recently I came across another watch which ticks all the boxes but significantly cheaper than the Astron. As you might have guessed, I am referring to the Citizen Eco-Drive Red Arrows Skyhawk A-T (Model: JY0100-59E). It features atomic timekeeping with radio controlled synchronised time adjustment, World Time in 43 Cities and is water resistant to 200 metres. Moreover, it has a Chronograph, power reserve indicator and Citizen's Eco-Drive technology which means that you do not need a battery. The case is quite big at 47mm and has a black stainless steel Pilot's Rotating Slide Rule Dial ring with silver tone stainless steel bracelet. It features the official Red Arrows insignia on the caseback and is presented in Red Arrows packaging. The watch retails at £449 - much cheaper than the Seiko Astron models. 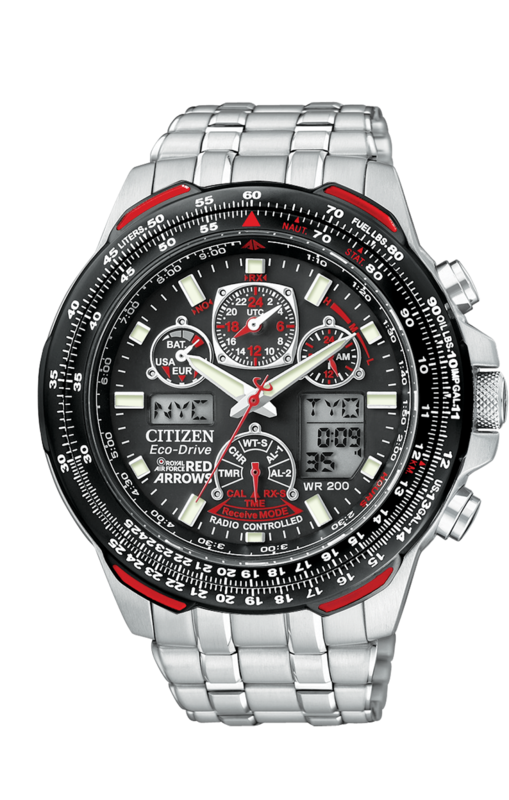 However, you can get the Citizen Red Arrows Skyhawk for £377.95 on Amazon UK.